Richard and Jack finally return from Europe to a troubled England. Available on pre-order on Amazon. Will they manage to complete the task they have been set, and release Lizbet and the rest of the men from their Island goal? Will they beat Andrew Kineer back to England, or will he arrive before them and succeed in striking his own deal with the Knights of St John. Mary is still on the throne, although her state of health is of increasing concern to those around her. Philip, armed with much of England’s wealth has left her to continue with the war against France. Catherine is still trapped in Elizabeth’s household, and has come to recognise that her own survival is now tied to that of her mistress. William Fitzwarren finds himself in the middle of a ugly battle between his sons. After disinheriting Robert he finds himself prey to his son’s bitter temper and can only hope for help. You would expect England’s largest monarch to have a huge tomb – however this is not the case. His daughters, Mary and Elizabeth, have ornate final resting places in Westminster Abbey, but all Henry has is a floor marker in a Chapel in Windsor. His coffin rests in a crypt beneath next to that of his favoured wife, Jane Seymour. His coffin has fallen apart, it might have fallen when the wood trestles it stood on collapsed, or it might have been the subject of grave robbers – who knows. 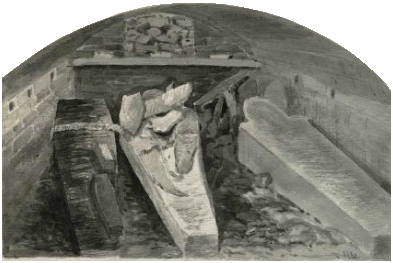 The picture is from a 19th C water colour made when the crypt was opened. Indeed the marble slab in the Cathedral marking the spot where Henry lies in the crypt beneath was not even placed int the chapel until 1837. That none of his children felt compelled to create a tomb fit for a monarch of England does raise a few questions. Elizabeth I – little known fact! 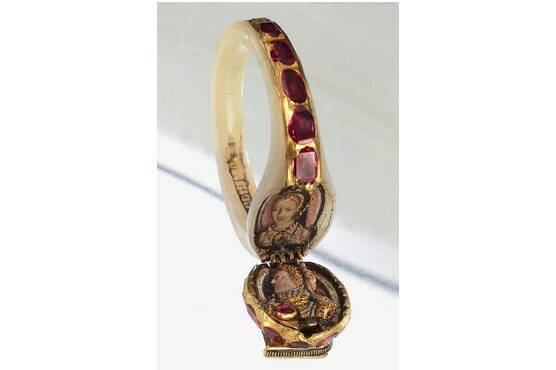 Elizabeth never spoke publicly about her mother – however she wore this ring, and it contains a miniature or herself and one of Anne Boleyn. So although she never publicly made a statement about her mother she obviously kept her memory alive in private. Elizabeth was two years old when her father had her mother executed. Henry VIII was never allocated a grand tomb, and perhaps this is because Elizabeth who could not provide one for her mother also decided her father should lie in relative anonymity as well. The ring shown below is beautiful in detail and show both women. If you look at the inner band on the ring you can see that the some of the enamel has worn away so this was piece of jewelry that Elizabeth often wore. Due to the troubles times Elizabeth lived through it has to be supposed that she had this made after her accession to the throne. 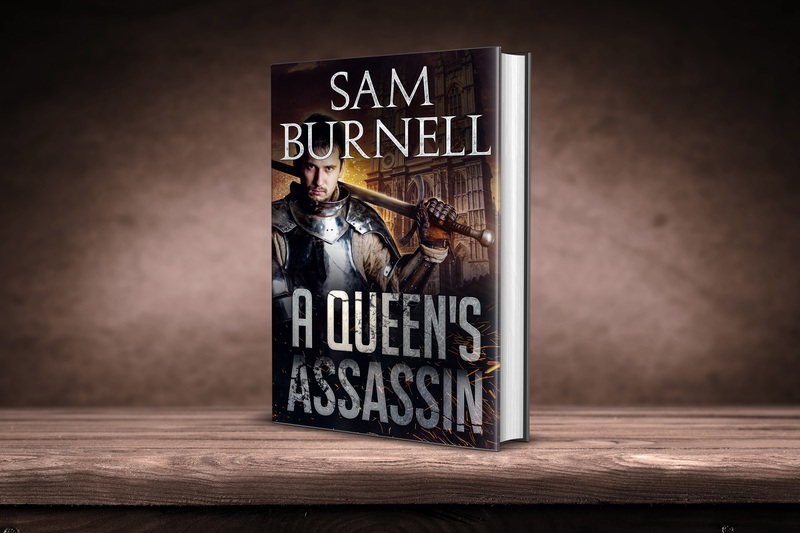 I am about to run a competition to name a new character in my next book, A Queen’s Assassin. If you would like to enter then use the websites contact page and send me your email address and I will add you to the competition mailing list. The prize will be to name the character, the will also get a signed copy of A Queen’s Spy the new version and a set of audio codes for the full series. Great news – Nathaniel Williams has completed the narration of A Queen’s Mercenary and the feedback from listeners is great. He had done a splendid job. 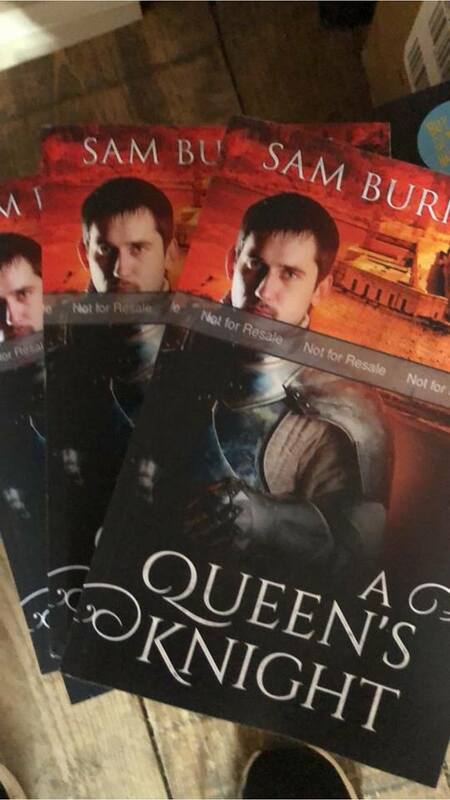 Currently he is working on A Queen’s Knight and this should be available on audible towards the end of March. Over the following months A Queen’s Spy, A Queen’s Traitor and The Tudor Heresy will all be re-recorded by Nathaniel as well. I have some audioi codes to give away. If you would like a free audio code for one of my audio books then just drop me a message on my website Samburnell.com, let me know if you would like a US or UK code and I can send you one over. Due for release in November 2018. John, ex forces and with an overdraft he can’t even bring himself to think about, finally finds much needed work. Able to offer technical expertise on military spec. equipment he finds himself working for an American company on their latest marketing campaign. Hank Scott is exploiting his links with Scotland to bolster his biscuit companies dwindling market share in the US. John might not be happy with situation but what choice does he have? John unearths a find that would not only clear his overdraft but would leave him wealthy beyond his dreams. However what he has discovered is so closely linked to the very heart of Scotland he knows he has to get it into the right hands. But which hands are they? What he has found will bolster national pride to such an extent that the British Government will loose control of Scotland, indyref2 will be a landslide. John knows that’s a mission he can bring about, but there are many set to stop him. The box set is now available on audible I have a limited number of promo codes so you can download the whole set for free on audible. If you would like a promo code then please just send me a message and I would be delighted to send you a code. First come first served as they say.